Skin type: ALL. The Essence Toner and Moisture Serum is suitable for all skin types from normal and dry skin to combination and oily skin types. The Nutrition Cream is primarily good for normal skin, dry skin and combination skin types. 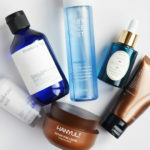 All products are suitable for sensitive skin, redness, irritated skin and rebellious troubled skin that’s out of balance. How to use: Apply a few drops of the Essence Toner after cleansing. Use your hands to gently pat in the product. Then apply Moisture Serum, and last the Nutrition Cream. Formula: Only carefully selected skin caring and soothing ingredients that do not irritate the skin. The products are anti-inflammatory. The products include Astragalus Membranaceus Root Extract and Coptis Japonica Root Extract . Good: Pure non irritant formula on all Pyunkang Yul skin care products. Only carefully selected ingredients. Minimalist design and a high quality premium feel. These products are anti-inflammatory and feels soothing and gentle. Also suitable for sensitive skin types, redness and irritated troubled skin. Relatively cheap prices for this quality and large generous packaging of 100-200ml. Bad: The pipette in the serum worked poorly on my bottle. The nutrition Cream may be experienced as a bit greasy. 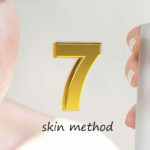 Result on the skin: The skin feels moisturized, deeply hydrated and nourished without being the least irritated or red. 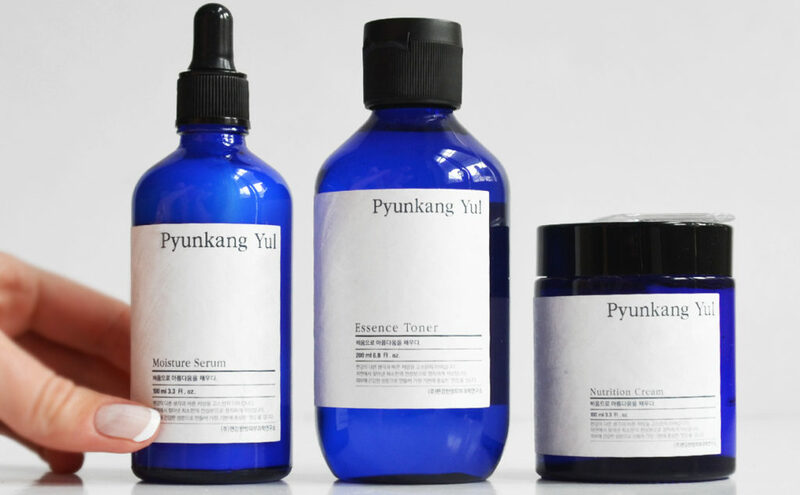 Let’s test some well-chosen products from Korean brand Pyunkang Yul. Here’s my review of the Essence Toner, the Moisture Serum and the Nutrition Cream. Pyunkang Yul is a cruelty-free brand developed by a Korean medicine clinic. 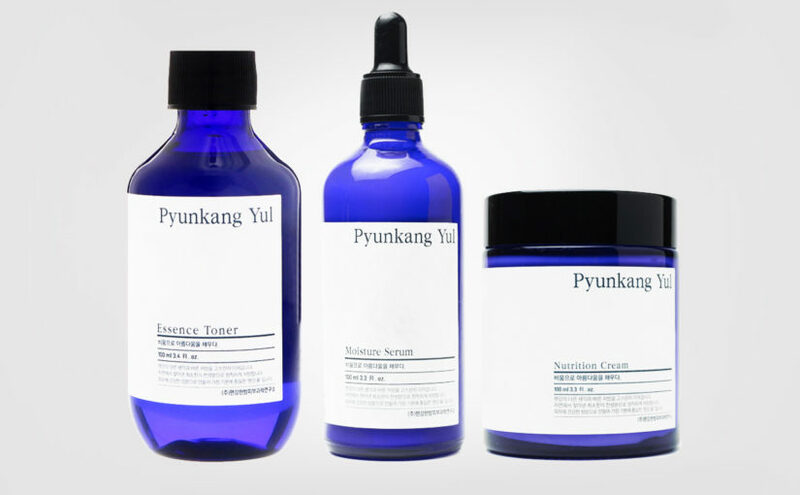 Pyunkang Yul’s skin care products contain a few carefully selected and natural ingredients. The brand doesn’t add any unnecessary additives or substances that “fill out” the products. With Pyunkang Yul you simply get pure and gentle, high quality skin care that does not irritate the skin. Sounds good right! 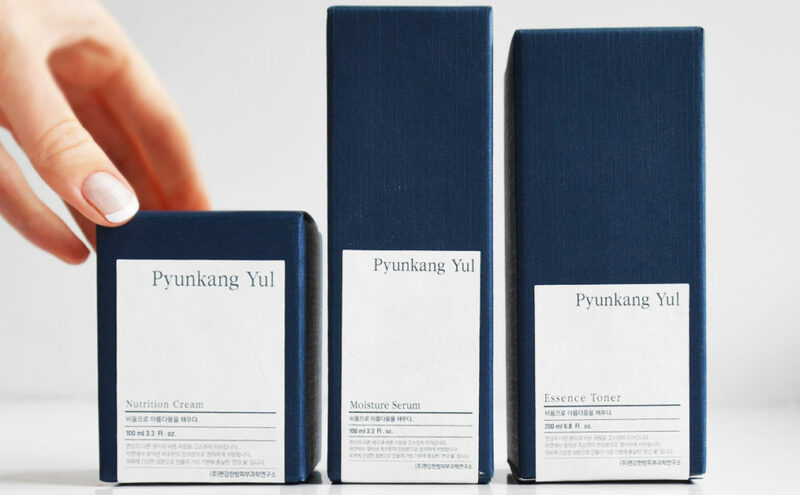 The premium feel is inevitable with Korean brand Pyunkang Yul. The design is minimalist, with great attention to details in the material and structures regarding the packaging. The paper feels handmade for one, and the jars and bottles are absolutely irresistible with their beautiful blue color. I’m thinking of old-fashioned pharmacies. Very neat and very nice! 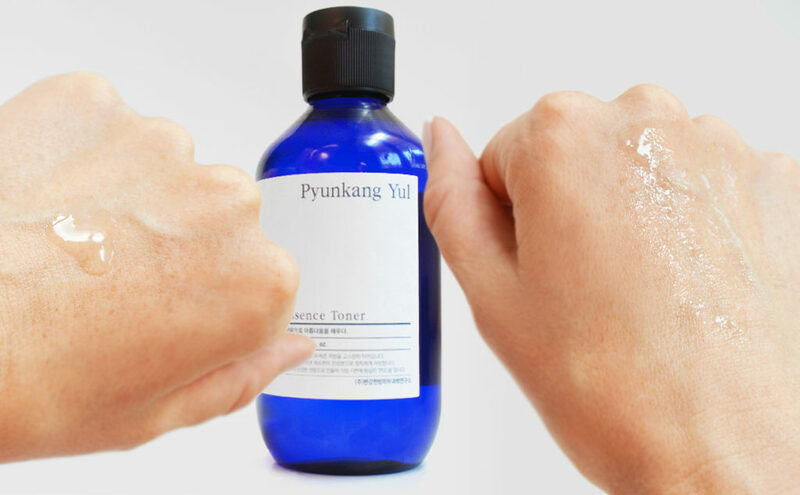 Pyunkang Yul Essence Toner is basically a toner and an essence in one product. Pyunkang Yul Essence Toner contains a full 91.3% Astragalus Membranaceus Root Extract / milk vetch root extract, a kind of leguminous plant. The Essence toner is packed with natural anti-oxidants, betaine and minerals and it’s an intensely hydrating and anti-inflammatory toner. A true skin care booster in my opinion. Pyunkang Yul Essence Toner is my absolute favorite product from this bunch. A very special skin care product indeed. This essence toner comes in a blue plastic bottle of a full 200ml, very generous. It’s a slightly thicker deeply hydrating and nourishing essence toner. Green natural plant type scent. Good absorption. 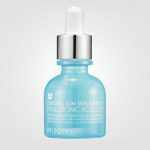 This product looks much like a light transparent serum. Smooth slippery feel on the skin. Pyunkang Yul Essence Toner really makes a difference to the skin I feel. The skin is immediately and deeply hydrated. 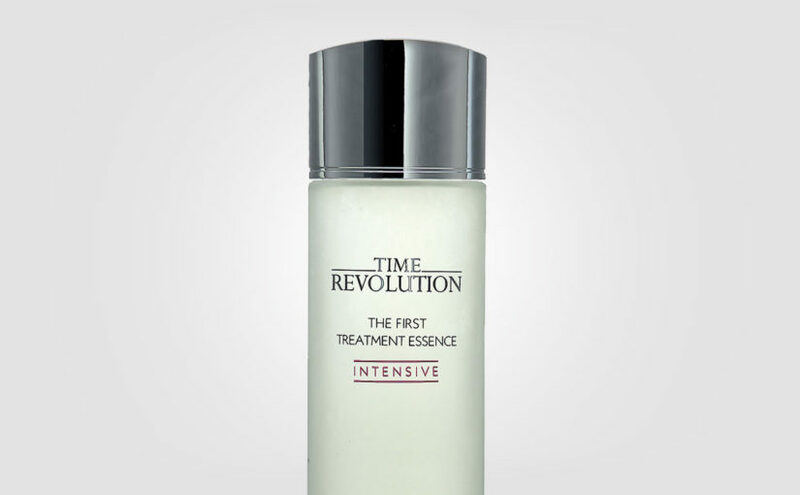 And this essence toner is excellent to apply in multiple layers to relief extra dry skin types. Really sticky feeling after application. However, the tackiness and stickiness disappears as soon as you apply the next product. 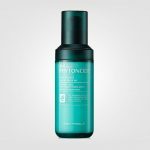 I find that Pyunkang Yul Essence Toner is deeply hydrating and soothing, and very gentle to the skin without irritating. I simply love this essence toner! 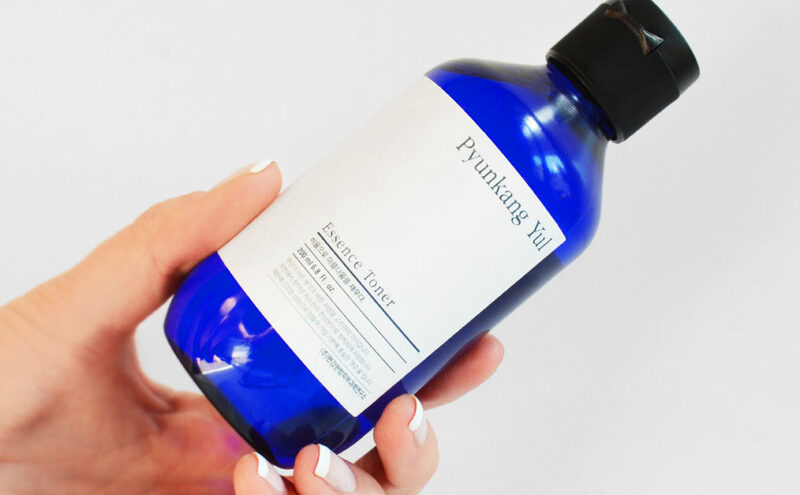 I would mainly recommend Pyunkang Yul Essence Toner for those who need a deeply hydrating and nourishing toner. Suitable for normal skin, dry skin and combination skin types, redness, sensitive skin and irritated rebellious troubled skin. Could even work as a moisturizer for oily skin types I would say. If you don’t like scented skin care, then the green plant scent may feel a bit overwhelming. Other than that, it’s a very nice good quality essence toner in my opinion. Highly recommended by me. Pyunkang Yul Moisture Serum is all about balancing, hydrating and soothing the skin. 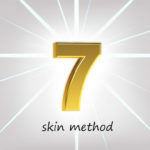 The formula helps the skin to find its optimal balance between moisture and oils. Contains Coptis Japonica Root Extract and olive oil which is anti-inflammatory, soothing and moisturizing the skin. Pyunkang Yul Moisture Serum is cooling the skin while providing deep hydration. Suitable for all skin types really. Especially good for skin that is out of balance and often feels sweaty and shiny. Good absorption. 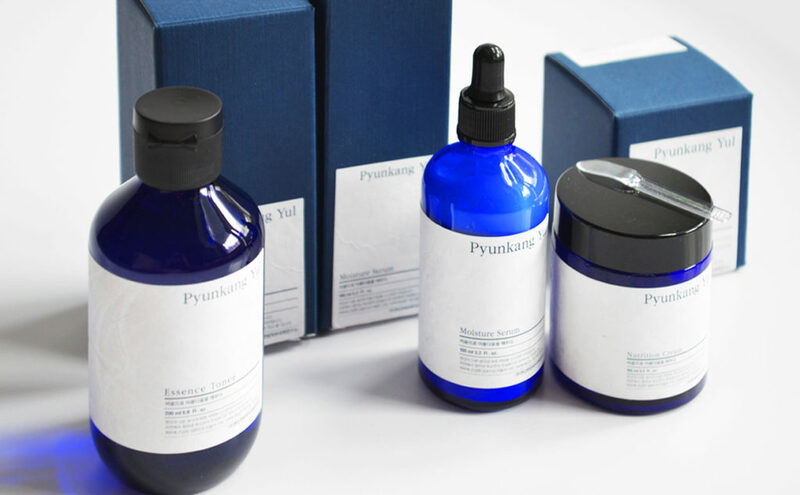 Pyunkang Yul Moisture Serum comes in an irresistible blue glass bottle with a pipette dropper. 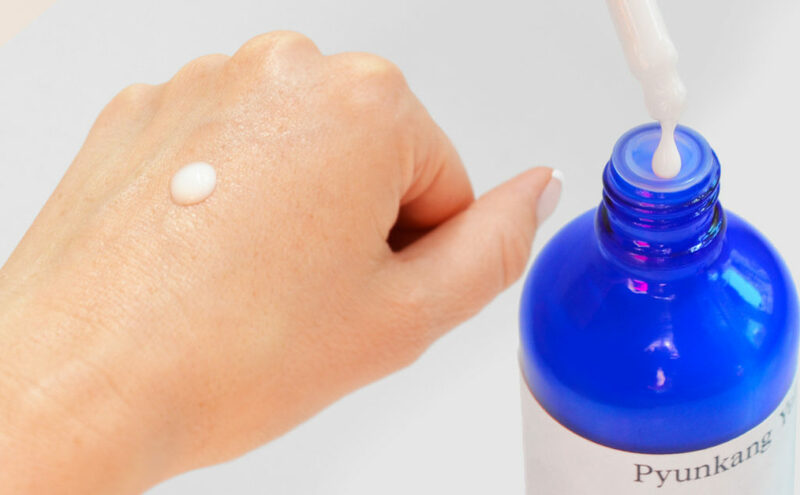 The serum is white and milky, similar to a slightly fluid moist lotion. It’s light rather than creamy in my opinion. It’s basically unscented and smells like skin care without added scent if that makes sence. The skin is nourished and deeply hydrated. Good absorption. The skin feels moisturized without being oily or sticky. Pretty soon I’m having some issues with the pipette dropper. I don’t know if my bottle is defect, but the pipette doesn’t get hold of too much of the serum when trying to pull it up in the dropper. Otherwise, it’s a really nice, gentle and milky serum that feels hydrating and soothing without irritating the skin. Perfect for all skin types actually. From normal skin, dry skin and combination skin to sensitive skin, redness, irritated skin and troubled skin. Also good for oily skin thirsting for moisture and skin that is off balance and often feels shiny. The product doesn’t feel heavy on the skin, just fresh like a light moist lotion. Huge plus for the gentle milky formula that is soothing and cooling. Very nice. Just like the Essence Toner, Pyunkang Yul Nutrition Cream also has Astragalus Membranaceus Root Extract / milk vetch root extract as the first key ingredient. 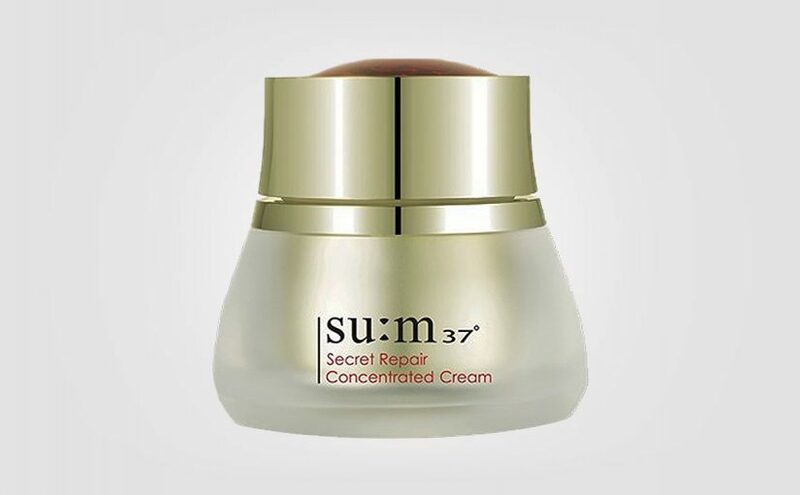 Anti-inflammatory and deeply nourishing face cream that is rich in antioxidants. Perfect for those with dry skin, rough skin and tired dull skin, or if you suffer from flaky skin and dry areas. Pyunkang Yul Nutrition Cream improves the skin’s elasticity, preventing signs of aging and giving the skin a healthy glow. 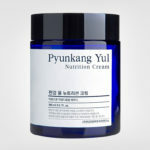 Pyunkang Yul Nutrition Cream comes in a blue glass jar with a screw cap that makes me think of old-fashioned pharmacies. Very nice minimalist design that makes Pyunkang Yul Nutrition Cream feel like a good quality premium product, and it is. This creamy rich face cream is deeply nourishing and moisturizing the skin. The cream is white, thick, glossy and creamy but still kinda “airy” in some way. I get the feeling that it do contain some oils. The skin is properly moisturized, soft and supple, but without the cream feeling sticky, thick or heavy on the skin. Good absorption even though this cream is quite rich. However, the skin feels a bit “smeared” and looks slightly shiny after application. This is not a face cream for oily skin types. If you have oily skin then take a look at “Pyunkang Yul Moisture Cream” instead. I love that Pyunkang Yul Nutrition Cream contains only carefully selected ingredients that are gentle to the skin. I would mainly recommend Pyunkang Yul Nutrition Cream for dry skin types because this cream may be perceived as somewhat “oily” and shiny on the skin. It also works great for sensitive skin types, redness, irritated skin or rebellious troubled skin in need of something calming and anti-inflammatory. 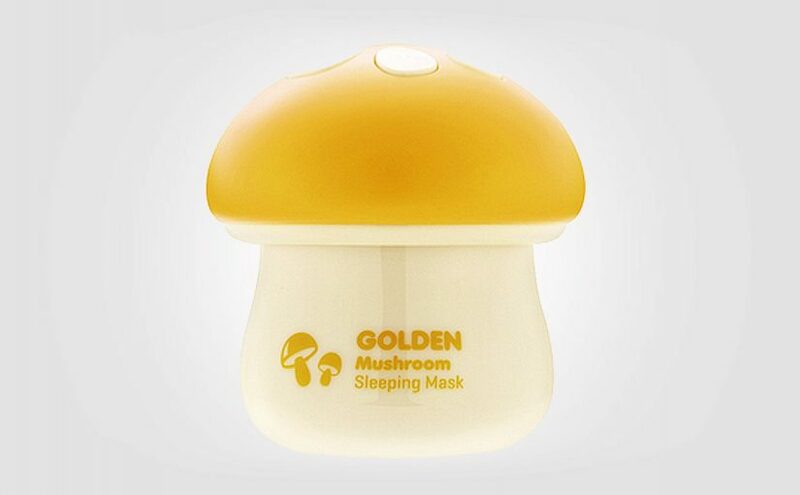 Also good for combination skin as a night cream. 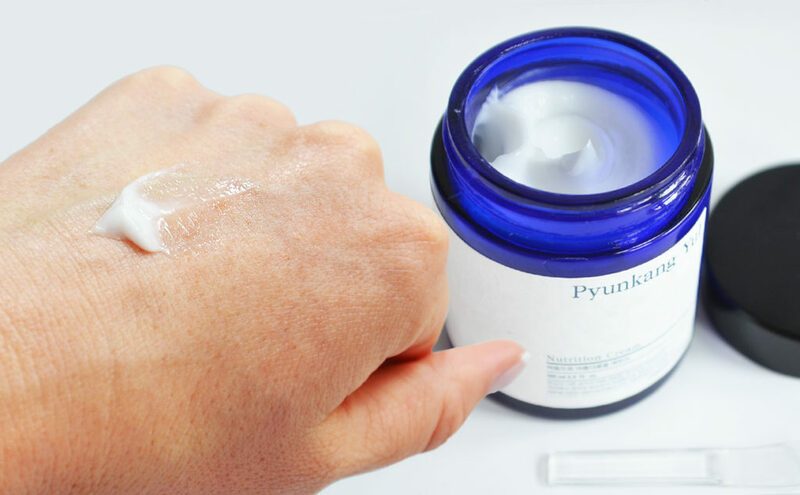 Pyunkang Yul Nutrition Cream helps blood circulation and boosting the skin with a youthful radiance. 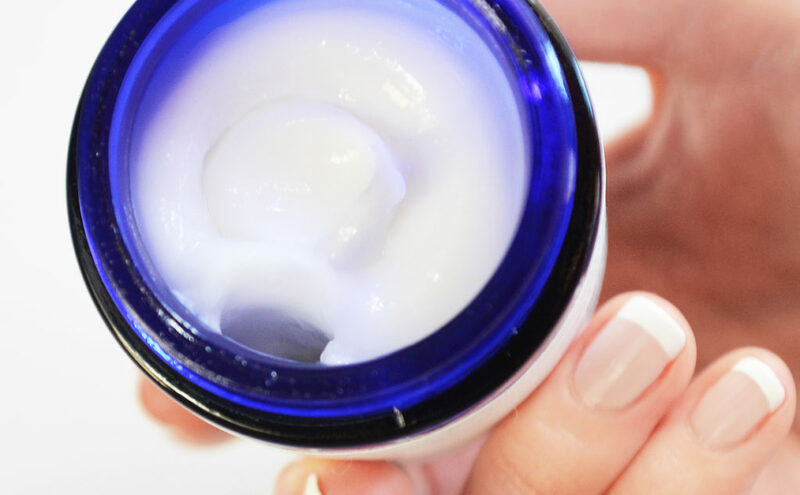 In short, a great and natural face cream without additives! For me, Pyunkang Yul is all about quality and the premium feeling is inevitable. Pure formula in stylish packaging. Completely irresistible! I really like the Korean brand Pyunkang Yul. I love the stylish minimalist blue packaging. Pyunkang Yul’s products keep a high quality in my opinion. Plus for the pure formula with only carefully selected natural ingredients and no unnecessary additives. 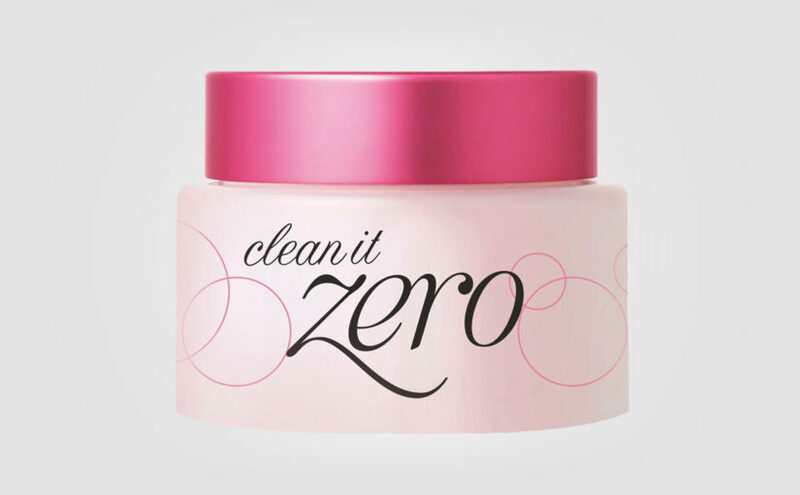 Plus because all products are gentle and soothing without irritating the skin. Big plus for the price range which is really good for this kind of quality. I don’t have much negative to say about Pyunkang Yul actually. The dropper on the serum could have worked better for me, but overall I would highly recommend trying out Pyunkang Yul. Especially if you have sensitive skin, suffer from redness or irritated itchy skin. The toner and the serum is suitable for most skin types while the Nutrition Cream is mainly for dry skin types in my opinion. I’m very impressed with Pyunkang Yul! I highly recommend Pyunkang Yul. These products contain only carefully selected ingredients that are soothing, nourishing and deeply hydrating the skin without irritating. 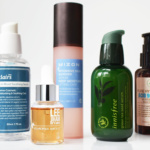 Best skin care products from Korean brand Klairs! 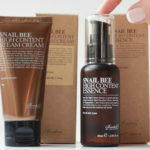 The Benton Snail Bee High Content line, perfect for winter!